DaVinci Resolve™ Studio has recently added support for scripting. Users normally interact with Resolve™ via the user interface. The scripting makes it possible to bypass the user interface and control the software by typing commands. This feature may be difficult for most users, but it opens up DaVinci Resolve™ Studio to third party applications. The first application to utilize the scripting is Meta Fide Projector. Setting up projects in Resolve™ is easy. Staying on top of your facility naming conventions can be onerous. In environments where there is a frequent project handoff it’s necessary to use standard nomenclature and bin organizational structure. It is also very useful to have all standard media assets like logos, bars, facility slates, graphics toolkits, etc. imported into a project. Doing all this by hand for each new project is time consuming. This is where Projector steps in. Creating a new project with Projector is as simple as giving it a name and clicking a button. All of the project’s bin structure as well as the common assets are defined in a user template. This template ensures all new projects adhere to the facility standards. However, it is also possible to define multiple templates. The user can build a template for each client or for each type of a job. Projector takes this a step further by allowing the command line use. This way other applications can trigger Projector automatically in the non-GUI mode. For example, it is possible for Adobe After Effects to launch Projector after completing the render, create a new DaVinci Resolve™ project, and import all the rendered shots into a bin. All this can take place without any user input. 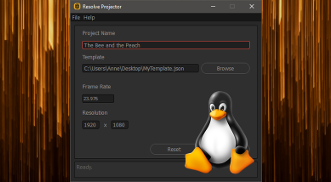 Projector is available from Meta Fide as a desktop application for Linux, MacOS, and Windows.